The sensor-embedded pill will be used to treat and monitor colorectal cancer patients receiving care at Fairview Health Services. 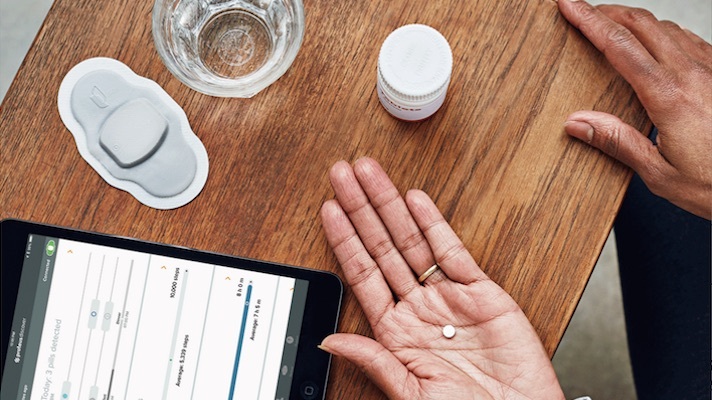 In conjunction with Fairview Health Services and University of Minnesota Health, Proteus Digital Health unveiled plans to pair its sensor-equipped digital pills with an oral oncology therapeutic. According to an announcement from Proteus, the new care model is currently being used to treat stage 3 and stage 4 colorectal cancer patients receiving care at Fairview. There, clinicians are prescribing “digital capecitabine,” which consists of the ingestible sensor, the accompanying mobile data platform and the established chemotherapy medication. Proteus will also be launching a registry of real-world data collected from multiple different care sites prescribing the digital chemotherapy, which the company said will help inform best practices and analysis of the care model. Alongside general medication adherence, the data collected through Proteus’ system will help patients will be able to easily self-manage information about their treatment such as the time it was taken or the dosage. With the patient’s consent, that data and others can also be shared through the platform with a physician or pharmacist so that they may better understand their patient’s adherence and condition. This can be especially useful for oncology, in which any number of variables could influence how an individual patient responds to treatment. Proteus had its first patch cleared in 2010 and its first pill cleared in 2012. But it made headlines in late 2017 when the FDA approved Abilify MyCite, which allowed the digital ingestion tracking system to be combined with a therapeutic. Before, hospital pharmacies had to take the pill and add the Proteus chip, whereas this system more closely integrated the sensor and pill. Since last year’s FDA approval, a handful of systems and health plans have been exploring the sensor-equipped platform, including Magellan Health, Desert Oasis Healthcare and Children’s Health. The platform has also seen some early support in the infectious disease community, with some researchers exploring its potential role in ensuring pre-exposure prophylaxis (PrEP) adherence for HIV prevention. This interest came in spite of warnings from some prominent voices in digital health, who noted the potential for privacy breaches or other foul play that are inherent with system that monitors and collects data on users’ behavior.